Luminus Devices, Inc., a global manufacturer of high-performance LEDs and solid-state light sources, recently announced volume availability of its new Xtreme Sensus chip-on-board (COB) LED array. Xtreme Sensus gives retailers and visual merchandisers new options for illuminating displays or creating atmospheres that make people feel engaged and excited. Building on the success of Sensus, Xtreme Sensus is even further below the blackbody locus and delivers an even brighter, ‘pure white’ light that studies have shown is preferred by observers. Luminus engineered Xtreme Sensus with an extended gamut area, greater than 130, which means colors will be saturated and provide a sense of energy while remaining aligned with people’s mental expectations for visual correctness. With Sensus and Xtreme Sensus, designers can more finely tune the experience they wish to create. 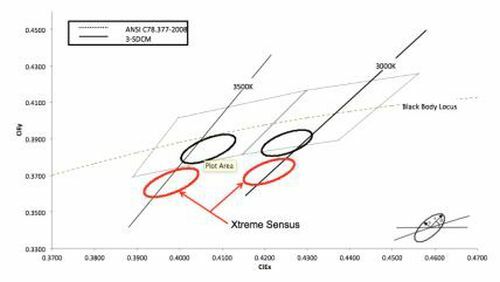 Xtreme Sensus extends Luminus’ Generation 3 platform that provides the industry’s highest efficacy (170+ lm/W), output and selection of light emitting surface sizes from 6 - 32mm. Luminus continues to evolve and refine LED technology so that designers and visual merchandisers can replace conventional lamps with more efficient light sources that are better targeted to their needs and more cost-effective over time. Complete specifications for Xtreme Sensus are available here. Xtreme Sensus is available now through Luminus’ global distribution network.